The Curiosity PIC32MZEF Development Board uses a PIC32MZ EF Series (PIC32MZ2048EFM) microcontroller. 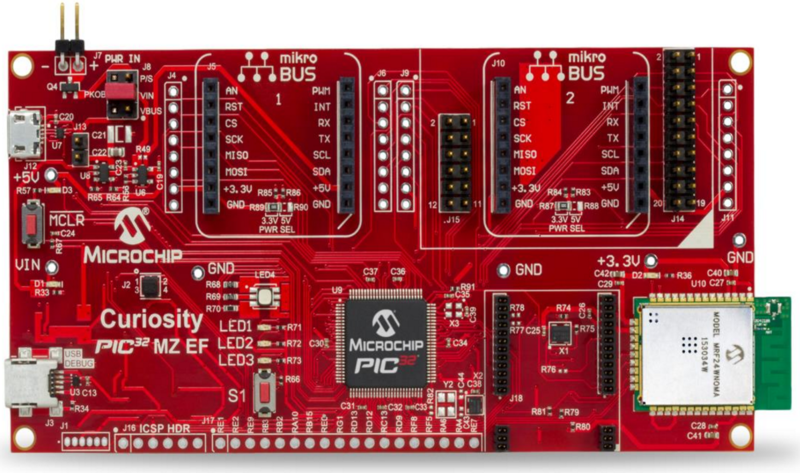 It has two MikroBus™ expansion sockets from MicroElektronika and connectors to mount Ethernet PHY and audio codec daughter boards. This board has an on-board programmer/debugger. No external programmer/debugger (e.g., ICD4) is required. The Secure click board from MikroElectronika carries the ATECC508A cryptographic coprocessor with secure hardware-based key storage. The click is designed to run on either 3.3 V or 5 V power supply. 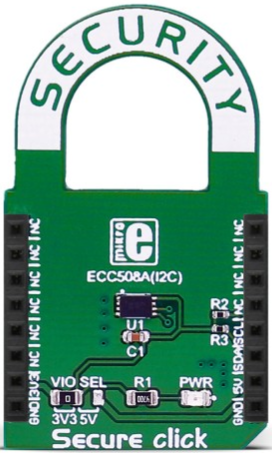 It communicates with the target microcontroller over the I2C interface. 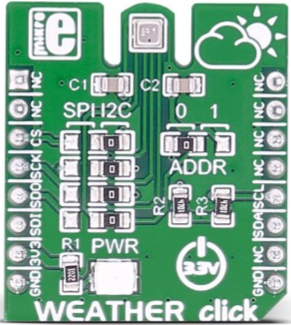 The Weather click board from MikroElectronika detects humidity, pressure, and temperature, specifically designed for low current consumption and long-term stability. The click is designed to work on a 3.3 V power supply. It communicates with the target microcontroller over the SPI or I2C interface. The microSD click board from MikroElectronika has a microSD card slot for microSD cards used as a mass storage media for portable devices. 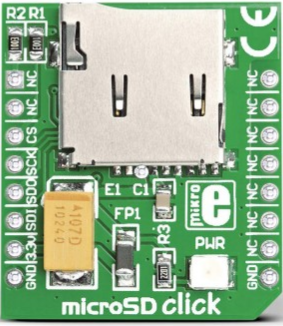 microSD click is designed to run on 3.3 V power supply. It communicates with the target microcontroller over SPI. 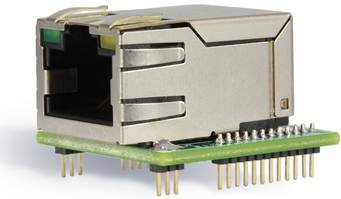 The USB UART click board from MikroElectronika uses an FT232RL USB-to-UART interface module and a USB mini-B connector. It communicates with a target board via a UART interface. 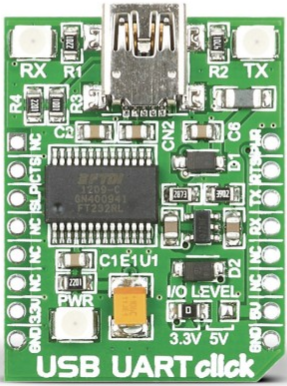 The board is powered with a 5 V power supply, but is designed to use 3.3 V or 5 V I/O levels (selectable via SMD jumper). 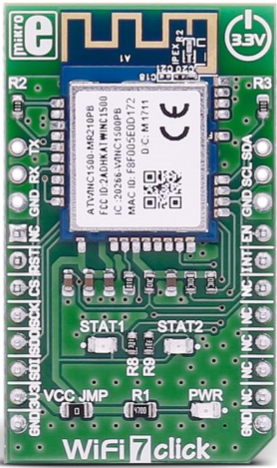 The WiFi 7 click board from MikroElectronika uses the ATWINC1510-MR210PB IEEE 802.11 b/g/n module, specifically optimized for low-power IoT applications. It is designed to run on a 3.3 V power supply. It communicates with the target microcontroller over SPI interface, with additional functionality provided by the following pins on the mikroBUS line: PWM, INT, RST. The LAN8720A PHY Daughter Board uses a small-footprint, low-power 10BASE-T/100BASE-TX Ethernet LAN8720A PHY. It is designed for easy development of RMII Ethernet control applications when plugged into compatible Microchip development boards. Detailed documentation on select projects can be found on the development board support page. All example projects included in the MPLAB® Harmony software framework are documented in the MPLAB Harmony Help file under "Volume I: Applications Help". To find all projects that use this specific board, search the Harmony Help file for pic32mz_ef_curiosity. This is the name of the board support package (BSP) assigned to this development board. sdcard_player/firmware The demonstration application creates an audio player that reads audio files (.WAV format only) from an SD card mounted on the click interface. The audio is played through the CODEC placed on the X32 header interface. It also provides the feature to switch to the next track on the media. firmware This demonstration (FreeRTOS version) shows how to connect an MRF24WN Wi-Fi® device with no keyboard or display to a wireless network. firmware This configuration demonstrates creating an Internet client and an Internet server that uses the MPLAB Harmony TCP API. This demonstration is a combination of the TCP/IP Client and TCP/IP Server application. web_photoframe/firmware The demonstration (FreeRTOS version) application creates a web photoframe that displays images, in the form of a slideshow on a web browser by connecting to a web server hosted on PIC32 Development board, over Ethernet or Wi-Fi interface. The images are stored on a micro SD card connected to the PIC32 development board. firmware The Wi-Fi RGB Easy Configuration demo (FreeRTOS version) showcases how to configure an embedded Wi-Fi device that does not have a natural keyboard and screen. By using the internal web server that accompanies the Microchip TCP/IP stack, you can use their browser as a conduit for programming the Wi-Fi device with the correct network parameters. firmware This demonstration application creates a USB CDC Device that enumerates as two serial ports on the USB Host personal computer. This application demonstrates the ability of the MPLAB Harmony USB Device Stack to support multiple instances of the same Device class. host/msd_basic/firmware This application demonstrates the use of the MSD Host Class Driver to write a file to a USB flash drive. The application uses the USB Host_layer, MSD class driver and the MPLAB Harmony File System Framework to enumerate a USB Flash drive and to write a file to it. firmware This application demonstrates the creation of a USB device with multiple logical units. The storage media, SD Card, acts as one logical unit, and the NVM acts as the second logical unit. Data transfer between a computer and the logical units (SD Card/NVM) takes place through USB MSD.